First things first: Happy birthday to my good friend Jeremy (@JeremyVanMan). I hope you have a great day! Second, it’s Monday, which means you’re probably having one of the worst days of your week. And that’s why I present The Monday Brews to you weekly. Hopefully by reading what I enjoyed over the past week you can forget about work for a few minutes and remember the fun games you played this past week. Have you ever tried to kick a pumpkin??? Ben Franklin’s Honey: I was able to enjoy my second to last of this homebrew while homebrewing. As Charlie Papazian says, “Relax and have a homebrew!” There’s nothing better than enjoying one of your hombrews while you’re homebrewing. Leinenkugels Oktoberfest: Now that the temperatures are dropping this seems like a more appropriate beer choice rather than like two weeks ago when it was 90 degrees. I love the oktoberfest style and attending Oktoberfest in Germany is definitely near the top of my Bucket List. New Belgium Pumpkick: Now that fall is nearly upon us it’s time to start enjoying spicy pumpkin beer. The New Belgium approach to pumpkin beer was an excellent one! Some pumpkin beers are just too pumpkinny, but this one was very nicely done with a subtle presence of pumpkin. Nicely done, New Belgium! Great Dane Stone of Scone Scotch Ale: The scotch ale style is quickly becoming one of my favorites. I used to consider Belgian styles as my favorites, particularly Tripels, but my palate is changing. This was brought to my house in a growler and was thoroughly enjoyed. New Glarus Staghorn: This is a local Oktoberfest style brew that the aforementioned Jeremy considers the best Oktoberfest there is. I cannot disagree. This is an excellent beer and I look forward to Autumn so that I can enjoy this particular beverage. 6 Player Kingdom Builder Variant of Awesomeness! Kingdom Builder x3: I’ve been loving this game since I bought the Crossroads expansion at GenCon. I think that the new expansion is a very nice addition to the game. And we also made a 6 player variant that would also work for 8 players. The picture shows the setup we used for 6 players. We played with three teams of two. You would work together and the final scoring would be done based on your two teams colors together. Yet the adjacency rule only held for your own color. I may write this up as a session report on BGG because it worked so well. The Little Prince: I can’t get enough of this game. We taught another new player and he enjoyed it despite not doing very well. It’s just so clever. On the flipside, I wouldn’t mind a retheme. Get on that, internets! Skyline: When looking for fillers, this game has been our pick of the poison lately. It’s simple. It’s quick. And it’s fun. My only complaint is that I wish the base dice, middle dice, and top dice were different colors. That would make it just a bit easier to see what dice you are actually using. But it’s a very fun game. So that was the Boards & Barley that I enjoyed last week. What did you enjoy?? 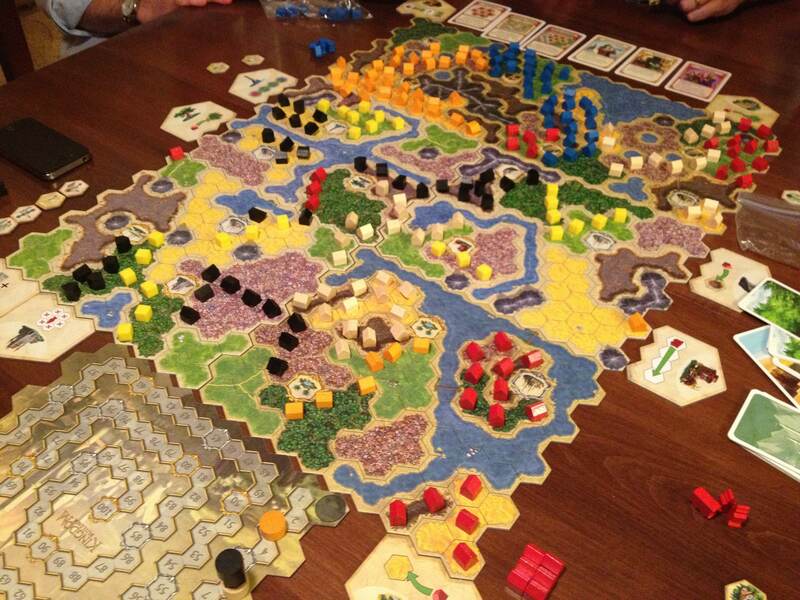 Posted on September 16, 2013, in Board Games, Monday Brews, The Barley, The Boards and tagged beer, board games, Great Dane, homebrew, Leinenkugels, Monday Brews, New Belgium, New Glarus, pumpkick. Bookmark the permalink. Leave a comment.